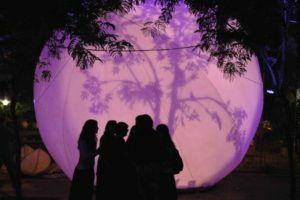 The Inprint Poetry Buskers will be at Discovery Green Sunday, September 30, 7:30 pm – 1o pm for “Moon Dance,” a romantic evening at moonGarden. A series of 22 illuminated spheres transform Discovery Green and the plaza at Avenida Houston into a magical moonscape. Ranging in size from six to 30 feet in diameter, moonGARDEN features 11 shadow “theaters” that tell the diverse, dynamic story of Houston and Discovery Green, as well as interactive works that allow visitors to become part of the experience. This is the largest ever created by Lucion Traveling Light of Montreal. After a stroll among the magical moonscape, dance to the Moon-inspired playlist with Dance Houston – salsa, tango, ballroom, swing and more. All the while, you’ll be able to get a free poem on any theme you request from a talented Inprint Poetry Busker. 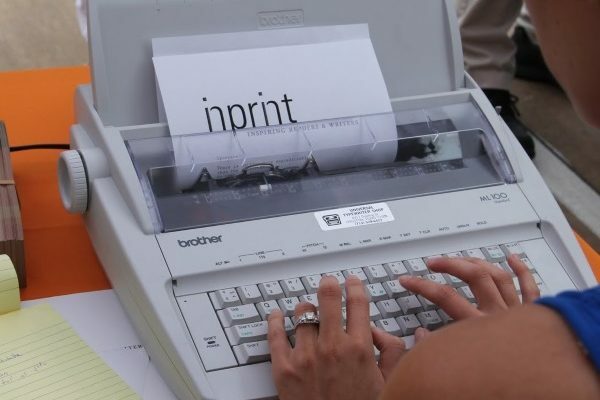 Come by the Inprint Poetry Busker table and experience the joy of poetry as some of the city’s top poets write you your very own poem using typewriters and the muse of immediate inspiration.